VisiPak offers over 170 sizes of stock clamshells available for immediate delivery off our shelf to yours. 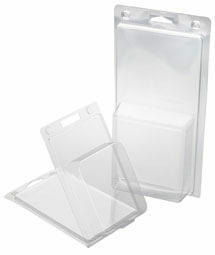 Stock Clamshells are the perfect answer when your project requires quick delivery to market with minimal upfront costs. Cavities are tapered from open to closed end. Cavity dimensions represent the smallest dimensions, which occur at the closed end. (P) Designates pyramid shaped cavity which is 1.000 x 1.000 at cavity base.